Attacks on Israeli Arab Sites: Good Story, Flawed Parts : NPR Public Editor An NPR report on recent vandalism to Arab sites in Israel unnecessarily confused listeners by lacking context and airing a tendentious interview about the Israeli right that should have been cut. But the story was not an anti-Israel diatribe, as some claim, and was correct in its main premise. 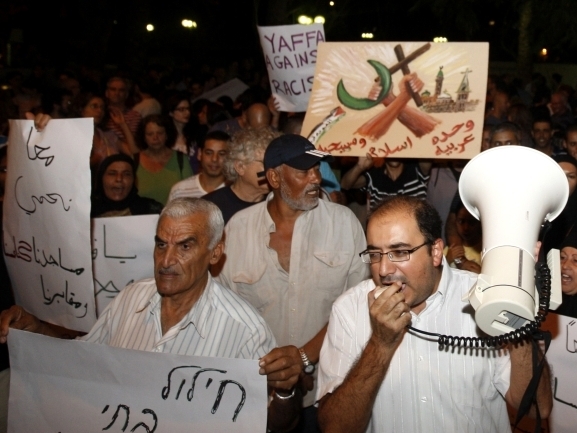 Israelis and Palestinians protest after two cemeteries, one Muslim and the other Christian, were vandalized by graffiti in the Arab city of Jaffa, near Tel Aviv, in October. It's almost a classic man-bites-dog story. Instead of a story about Palestinians attacking Israelis, NPR freelancer Sheera Frenkel reported on what is believed to be militant Jews vandalizing Arab sites inside Israel. But as with many stories involving the Israeli-Palestinian conflict, heated objections followed. Sheera Frenkel's Nov. 18 NPR news report charges Israel with a purported agenda 'to have a purely Jewish state and to get rid of all Palestinians, the ones in the West Bank and in Israel,' as one of her main interviewees puts it. Frenkel bases her alarmist story on three cases of vandalism and the distortion of terminology, among other misrepresentations. Many listeners sent emails with similar complaints, picking up on the details outlined by CAMERA. The charges are serious, and so I went back to investigate. What I found is that Frenkel's story was tendentious in one part and lacked context, but it is not the anti-Israeli diatribe CAMERA portrays it to be. It's a legitimate story about actual developments—a series of acts of vandalism to Arab sites in Israel by alleged militant Jews. For most Americans, this is unexpected and therefore news. It also underlines how so much in the Middle East is not black and white, which in my experience is something most Israelis understand better than Americans. To say this is not to engage in moral equivalence about any one act, especially a violent one, but it does recognize the indisputable fact that wrongs continue to be committed by both sides. Over the last few months, there have been a series of attacks targeting Palestinians within Israel. In October, a mosque in the northern Arab village of Tuba Zangaria was torched and a Muslim cemetery in Jaffa was vandalized and tombstones smashed. At both sites, graffiti was found linking the attacks to Israeli settlers from the occupied West Bank. There does appear to be a trend of some kind. In early October, the arsonist attack of a mosque in Al Fajjar marked the third time a mosque was damaged in the West Bank in 10 months. A popular Arab restaurant in Jaffa was apparently set ablaze in October. As in many of the incidents, new graffiti found at the site said "death to Arabs," Frenkel reported. After summarizing the situation, Frenkel then interviewed a Jewish protestor who was sympathetic to local Arabs. This woman said that these acts demonstrate a larger effort to establish a "purely Jewish state." NPR and Frenkel did not make that statement, as CAMERA charges. The protestor did. But while the interview captured some of the frustration among many Israeli Arabs and their supporters, Frenkel should have addressed the facts of the charge in some way, if just to note that this is an extreme view, and certainly not one shared widely by Israeli Jews. As Sara Miller of Forest Hill, NY, wrote, "A few cases of vandalism by a fringe group hardly prove such a charge." Still, the frustrations of Arab Israelis are very real. Many of them feel like second-class citizens in a land where their families have lived for centuries. The Israeli government, moreover, is adamant in restricting any right of return for Palestinians who fled during the 1948 war that led to establishment of Israel as a Jewish state. As Frenkel wrote to me, many Palestinians agree with another woman interviewed in the story—this one Arab—when she said that "Zionism" is to blame for growing "racism" against Israeli Arabs. Frenkel said that three people she interviewed that day expressed the same thought. "Therefore, I felt it was an important point of view to include," she said. I agree. At the same time, however, successive Israeli governments—not to mention many Israeli Jews themselves—have taken many measures to integrate Israeli Arabs. CAMERA cites affordable housing that the Tel Aviv-Jaffa municipality is reportedly planning to build for Jaffa's Arab residents. A number of Israeli leaders have condemned the attacks against the Arab sites. In October, Israeli Prime Minister Benjamin Netanyahu took note of the desecration of graves in Christian and Muslim cemeteries in Jaffa during Yom Kippur and said Israel is "not willing to tolerate vandalism, especially not the kind that would offend religious sensibilities." Although radio journalists are constrained by time—this segment was only four minutes long—it would have made for a more rounded story to include the government's reaction. According to Frenkel, the Netanyahu government is actually letting local police handle the recent vandalism. But that information was also not included. Some listeners would have liked mention of the Arab attacks against Israelis as balance. Palestinian bombings and other attacks over the years have killed hundreds of Israeli Jews. By contrast, these arson attacks against Arab sites have, so far at least, not killed anyone. It would not have been wrong to give this context, but I don't think it was necessary. We know well the dangers that Israelis face, or at least well enough to have a general impression that they seem common. NPR reports on the more dramatic attacks from time to time. What few of us probably know is in fact this more hopeful news: such attacks against Israelis are way down. According to the Israel Defense Forces website, anti-Israeli terrorism has dropped sharply since the early 2000s. In 2006, for example, almost 600 shooting attacks by Palestinians against Jewish civilians in Judea and Samaria were reported, in comparison to only 11 such attacks in 2010. During the first half of 2011, five such attacks were reported. No terrorism is justifiable, of course. A separate flurry of criticism was raised by another statement made by the Jewish protestor interviewed by Frenkel. One assumes that she is from the left, because she said of right-wing Israelis, "They don't call them Palestinians. They call them Israeli Arabs. That's their way to erase their Palestinian identity, okay?" She said this in English, which was convenient for the reporter's production purposes, but the statement was misleading, at best, and should not have made the air. As Lisa Kessler of Amber, PA, wrote: "The term 'Israeli Arab' is not a pejorative but the commonly accepted description of Arabs with Israeli citizenship, a term that has been used by NPR itself." I have used the term here and, indeed, it has been said on NPR in other reports. Her statement should have been cut from the report. That said, the woman is getting at what is a genuine issue surrounding the use of terminology in referring to Palestine and Palestinians. The Israeli right does sometimes go to Orwellian efforts to pretend neither exist. Newt Gingrich's recent statement that Palestinians are an "invented people" hardly helps. It is true that there is no generally recognized state of Palestine under international law yet—its borders are still up for negotiation, if negotiations ever resume—but there is clearly a Palestine by almost every other measure. Even my father, who was a Jew born in Tel Aviv far before the creation of the state of Israel, always referred to having been born in Palestine. Frenkel noted in an email to me that Israeli Arabs, who make up 20 percent of the Israeli population, reject the phrase "Israeli Palestinian" as "highly, highly offensive" and prefer being known as simply Palestinian. I give great weight to what someone wants to be called, but they are Israeli citizens and, while they are free to call themselves what they want, it is confusing for the news media to call them Palestinians, at least as a first reference. That is what people are called in the occupied West Bank and Gaza and in the presumably future state of Palestine. This is akin to the issue of what to call immigrants in the United States. Another question CAMERA raised was about the B'Emuna housing construction firm and whether it is contributing to the ethnic polarization happening in Jaffa. That is a complicated truth to find. There appears to be little doubt that, at least historically speaking, B'Emuna does primarily build housing specifically for Jews. But B'Emuna's website does not specifically say that. Frenkel did give some background on this, including reporting that Israel's high court ruled against a petition demanding a halt to the buildings in Jaffa. Frenkel also gave the company a chance to respond, which it declined to do on tape. But overall, the piece left the listener feeling uncertain about what is really going on in that community and did not mention, as CAMERA did, that the municipality of Tel-Aviv reportedly plans to build housing units specifically for Arab residents. There was also a discrepancy about the size of Tel-Aviv. "She erroneously believes that Tel-Aviv is Israel's largest city. She might want to visit Jerusalem someday," wrote Marcelo Messer from New York, NY. Both Frenkel and Messer are correct but are counting the numbers differently. Metro Tel-Aviv is much larger than metro Jerusalem. But the municipality of Jerusalem is largest—in area and population—if you include all of East Jerusalem. Israel considers annexed East Jerusalem part of the city and includes it in its population counts. It is the only country to do that. Stories about the Middle East are often controversial because they involve a subject that is inherently divisive and subject to heartfelt emotion. With its several lapses, Frenkel's story unnecessarily confused listeners on an important topic deserving clarity. This column incorrectly identified the construction company that CAMERA said planned to build housing specifically for Jaffa's Arab residents. CAMERA did not name a specific construction company, but said the municipality of Tel-Aviv plans to build the housing.